So far its been running well with very little maintenance required, as per my original plan. 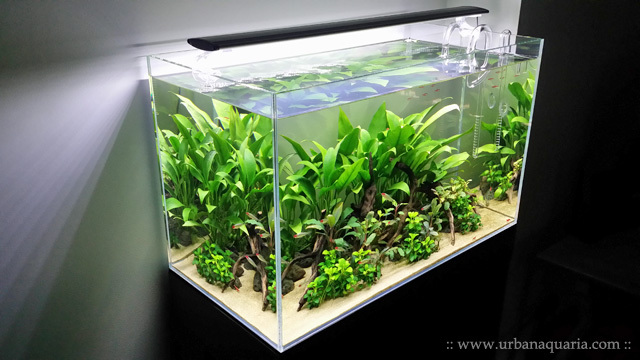 Over time, i've gradually stopped dosing fertilizers and excel as i found that the plants already get sufficient nutrients from the tank's ecosystem and their carbon requirements aren't very high anyways. The fact that all of the plants are rhizome based also helps as they can store lots of resources for future usage, so the plants have their own inbuilt buffers against fluctuating nutrient levels. Platinum rummy nose tetras were added just after the tank was setup, they form the main group of fishes for the tank now. Their exceptional schooling ability really ties everything together perfectly. 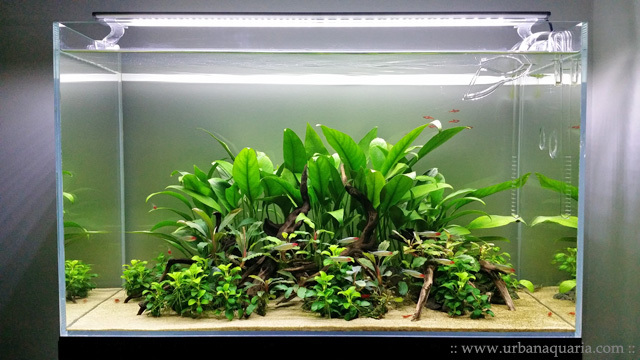 Despite their slower growth rates, the plants sprouted out quite a good amount of new leaves... the various anubias and bucephalandra clumps have developed into denser bunches and slowly filled out the aquascape. I also found that rumors about anubiases as low nutrients plants are terrible wrong.